In the picture, left to right are: Mary Lynne Werlwas, Karen Hamberlin, Marlen Bodden, Mr. Mekuriya, Mr. Kitila, Jane-Roberte Sampeur, and Peter Mitchell. William Gibney and Richard Blum attended but are not in the photograph. 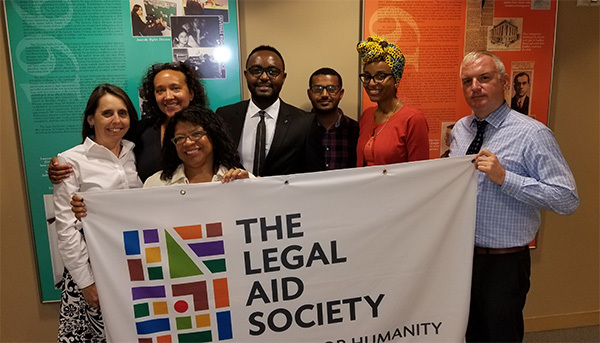 Lawyers who teach at Haramaya University College of Law, Ethiopia, visited The Legal Aid Society’s offices on August 15th. The lawyers, Endalkachew Mekuriya and Natae Kitila, are among the founders of the first Legal Aid in Ethiopia, which already has 40 offices and provides free legal advice and representation in civil and criminal matters to poor people, primarily women, children, the elderly, and people with disabilities. Our staff from the Criminal Defense and Civil Practices met with Mr. Mekuriya and Mr. Kitila to open a dialogue about forming a partnership with Legal Aid of Ethiopia.